Dredge quartered pheasant in following mixture. Using three tablespoons butter, brown pheasant in Dutch oven over medium heat. When golden brown, add one-half cup dry red wine, three sprigs fresh parsley, several carrot slices and one celery stalk. Put cover on tightly; cook over low heat or in 325-degree oven for 40 minutes. 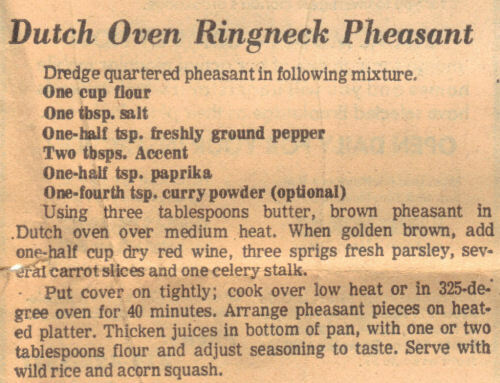 Arrange pheasant pieces on heated platter. Thicken juices in bottom of pan, with one or two tablespoons flour and adjust seasoning to taste. Serve with wild rice and acorn squash. My husband hunts and I do my best to cook everything he brings home. This recipe was so easy, had a beautiful presentation and the guys absolute loved it. I measured the breading ingredients in the morning, skipping the Accent and adding Cajun seasoning, as well as chopping the vegetables. That evening I threw everything together and it was a hit!